The QuickSnipe core was developed in 2003 by a group of eBay enthusiasts who were not happy with current snipping solutions. So, they began developing the fastest and most reliable sniping software found on the net today. Since, its inception it has successfully sniped tens of thousands of eBay auctions. 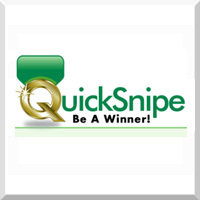 QuickSnipe.com is commited to developing the best and most comphrensive eBay auction sniper and buyer resource site on the net. Our goal is to provide an ultra-reliable auction sniping service, while developing new features to enhance your eBay auction buying experience.